Its probably fair to say that chocolate and hazelnut is one of my favorite flavor combinations, which should be obvious if you read last weeks post. I am racking my brain to try and think of anything else that comes close...maybe strawberry and vanilla, chocolate and peanut butter, or caramel and sea salt. Coincidentally, all would make excellent macaron flavors. 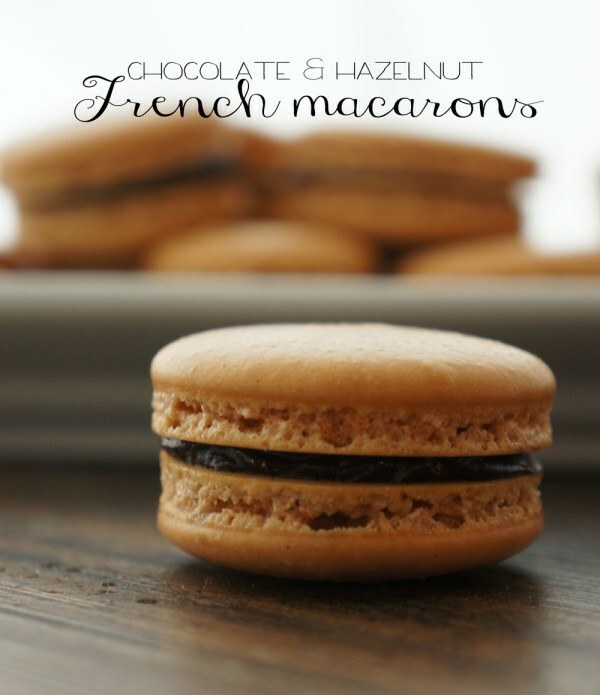 I have shared a macaron recipe before, but this time I am really going to go into the steps of making macarons. I have done a lot of experimenting and found some techniques that have worked well for me and ensure that my macarons turn out perfect! Every basic macaron recipe starts with the same 5 ingredients: almond flour, powdered sugar, granulated sugar, egg whites, and cream of tartar. I prefer to use Bob's Red Mill almond meal because its a pretty finely ground and the skins have been removed. The Trader Joes stuff will work, but I would recommend processing it in a food processor before you sift it or else you will be throwing away good pieces of almond. I also highly recommend sifting the almond meal BEFORE you measure it. Even if you use Bob's Red Mill almond meal AND you process it, inevitably you will still have large almond pieces left over. Once I have 3/4 cup of sifted almond meal, I whisk it into my powdered sugar and make sure there are no clumps. The next major step is to whip up the eggs until they form a meringue. To make the meringue, I start with room temperature egg whites. I separate the eggs about 2 hours before I want to make the macarons, but this can be done overnight, too. I start whisking the eggs on high until the look a little foamy, then I add a pinch of cream of tartar. Eventually, the eggs will start to look opaque, which is when I slowly add the granulated sugar. Once all the sugar is in, I basically set the whisk on high and forget it until the eggs are shiny and white and resemble shaving cream. Because I wanted to flavor the macarons, I added hazelnut extract and food coloring to the meringue. If you forget, you can add it in when you mix in the almond meal, but I always worry that I might over mix the batter. I fold the almond meal into the meringue pretty gently. I just keep going until I no longer see dry almond meal and sugar. A lot of people liken the consistency of properly mixed macaron batter to molten lava. To me, that is kind of arbitrary since I have never seen molten lava. So I like to stir it until it slowly runs off my spatula in one stream of batter. If it is clumpy and and just breaks off in "pieces", it needs a few more stirs. The mat you see in the picture above is the best macaron related purchase I have made. I love it! It helps me pipe out the macarons consistently and evenly. To pipe the macarons, I spoon the batter in either a piping bag or a plastic bag and snip off about 1/2" from the end. I like the opening to be rather wide so that I can just pipe out the batter in the center of the circle and keep the piping bag in the center almost like I am piping out a Hershey Kiss (rather than piping around the perimeter of the circle). The batter is so runny, that it will settle out to form a flat circle like you see above. To encourage that, I tap the bottom of the baking sheet on the counter which gets rid of any bumps or air bubbles. One thing about macarons that is very different from other cookies is that you must keep them out to dry out for at least 15 minutes until you can press your finger on the top of the macaron and it just barely tacky. I like to start preheating the oven at this point, so the macarons and oven are ready at around the same time. I bake the macarons (one sheet at a time) at 300 degrees for 16 minutes. I set the timer for 8 minutes, rotate the baking sheet, then bake another 8 minutes. I find that the lower temperature and longer baking time helps them dry out and puff up, especially if you live in a humid area. Once they cool, they should easily peel off of the mat. If they don't, they are undercooked. But hopefully, you have a flat bottom on the cookie like the ones above. Then you can fill the cookies with Nutella or chocolate ganache. Guess which one I chose? (hint: Nutella). I only spoon Nutella onto half the cookies. I take a plain matching cookie and press the Nutella down so it spreads across the surface and starts to peak out the sides. Then I dig in! I am actually pretty good about not gorging myself on macarons. Partly because they are fairly rich for being so small and because I normally make them for other people. There is no sense in spending all that time and money (almond meal is expensive!) to just eat them yourself. Plus, I find that if you bring these to a party, people will be really impressed with your baking skills! What is your favorite macaron flavor? What flavor should I make next? In a large bowl, whisk together the almond meal and powdered sugar until all clumps are removed. In the bowl of a stand mixer with the whisk attachment, start whisking the eggs until slightly foamy. Add the cream of tartar and continue to beat on high until opaque and form soft peaks. Slowly add the granulated sugar and beat on low until fully incorporated, then continue to beat at high speed until the egg whites form stiff peaks and a white and glossy. Add in the hazelnut extract and food coloring and mix until combined. Pour in the almond-sugar mixture into the eggs and fold until it is completely incorporated and there are no dry clumps. Spoon the mixture into a piping bag, snip off about 1/2 inch from the tip and pipe onto a baking sheet lined with parchment or a silicone baking mat. Once all macarons are piped, tap the baking sheet on the counter to remove air bubbles, then let sit for at least 15 minutes, or until the tops of the macarons have dried out and are no longer wet. Meanwhile, preheat the oven to 300 degrees. Bake the macarons, 1 sheet at a time, for 16 minutes, rotating after 8 minutes. Remove from the oven and let cool. Spoon or pip on the chocolate hazelnut spread onto about half the cookies, then top with a plain cookie.